After NVIDIA’s release of the new Pascal-based GPUs, all the big OEMs on the market rushed to deliver their updated or just refreshed notebooks with the chips in question. 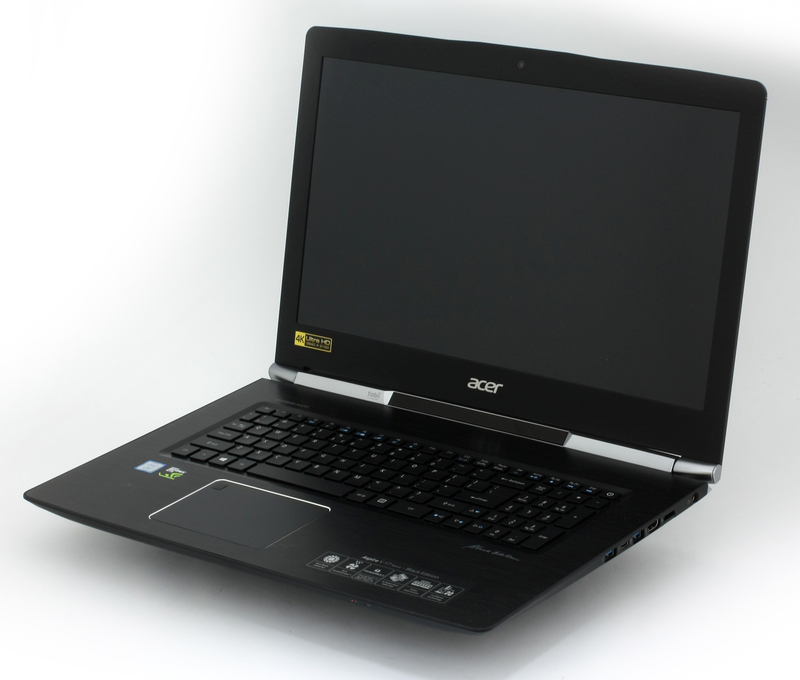 However, Acer didn’t come up with new Aspire Nitro notebooks but instead launched a more affordable version of the Predator 17 (G5-793) equipped with GeForce GTX 1060 with 6GB GDDR5 VRAM. That move bought the company some time to prepare its true upper mid-range to high-end solution with GTX 1060 – the Aspire V 15 and V 17 Nitros. 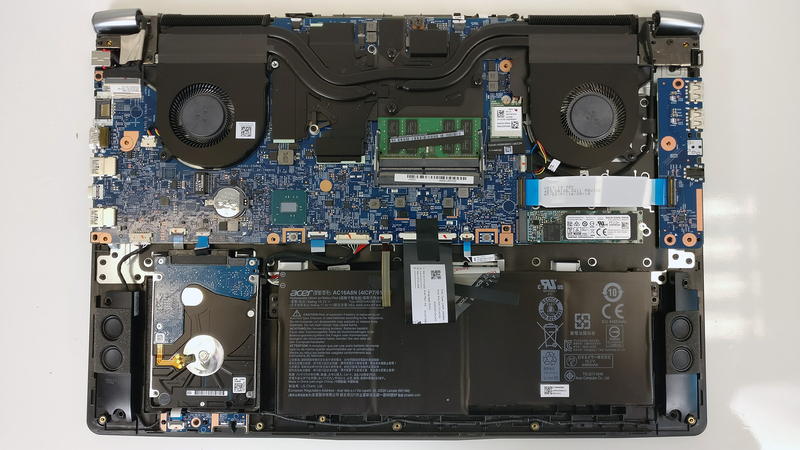 In this review, we will be taking a closer look at the top spec-ed 17-inch Aspire V 17 Nitro Black Edition configuration with GTX 1060 (6GB GDDR5), Intel Core i7-7700HQ, 16GB of DDR4-2400 RAM, 256GB M.2 PCIe NVMe SSD, Tobii Eye Tracking (which is expected to be included in all 17-inch modifications but the information is still unconfirmed) and a crisp UHD (3840×2160) IPS display. Of course, the GPU won’t be able to drive all those pixels in modern games but it will be essential for other multimedia-related purposes. The price of this model is expected to be around €1 900, but the standard Full HD version of the notebook should come near €1 300. The pricing definitely seems promising and if Acer is able to pull it off, we will have a much better alternative to the lackluster ASUS FX502VM with roughly the same pricing. The unit we received is a pre-production sample but it came in its original package. It’s identical to last year’s black, simplistic box with the usual user manuals, AC cord and charging brick included. The new V 17 Nitro keeps it true to its roots with modest changes in the design department. The overall feel and looks of the notebook are practically the same with some minor changes in the choice of materials but nothing too drastic. In fact, the weight and height of the chassis remain largely the same by tipping the scale at little over 3 kg and measuring 25 mm thickness. The first thing we noticed in the new version is the lid. 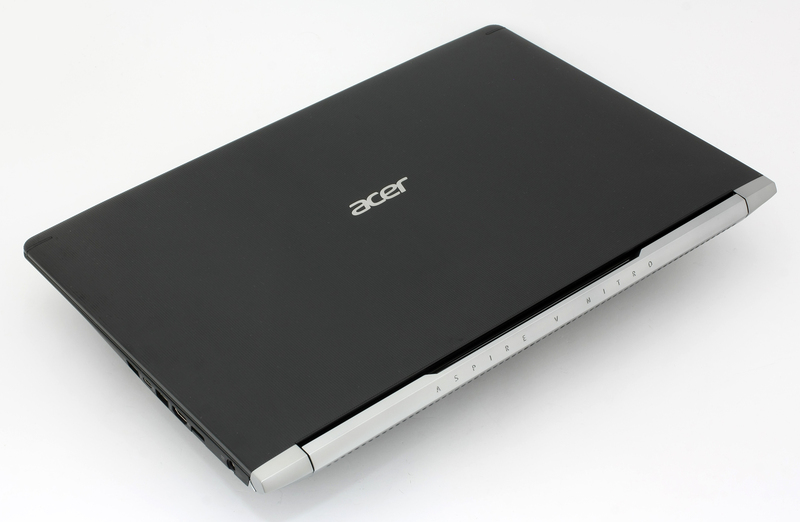 It keeps the hairline plastic brush finish but according to Acer, the aluminum plate inside is still present. We can easily tell it’s true because the new lid retains the sturdiness because it’s not easily bendable. The hinge design hasn’t changed as well with plastic element covering the Tobii eye tracker and both hinges. They appear to be stealthy, stable and offer easy opening with just one hand at the beginning of the travel but as yo go towards the end, the base starts to lift. This should prevent wobbling during typing on an unstable surface. 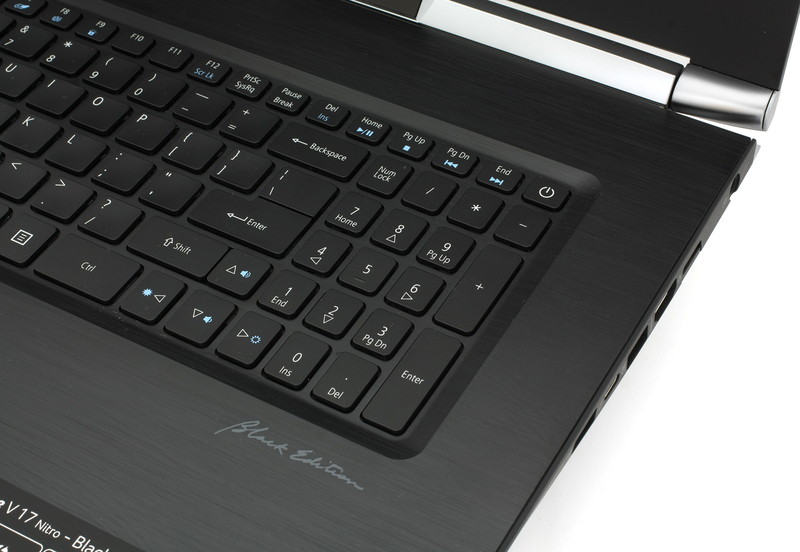 The bottom piece remains the same as well – soft-touch matte black surface while being extra rigid. The rear exhaust vents are easily noticeable while the bottom grills provide some extra airflow. Unlike last year’s model, the new V 17 offers a more healthy port distribution along the sides. Now the right side isn’t so overcrowded, although we still prefer most of the connectors positioned on the left. Two USB 3.0, HDMI, LAN and the DC power connector can be found on the right side along with the USB-C 3.1 port supporting the Thunderbolt 3 standard while on the left, you can see two USB 2.0 connectors, two separate 3.5 mm audio jacks for external microphone and a headset and the SD card reader. It’s also worth noting that the 25 mm thickness of the device ranks it amongst the most portable GTX 1060-powered solutions on the market. We just hope that the cooling system can make up for the lack of breathing room. The interior is probably the most noticeable change compared to last year’s V 17 Nitro Black Edition. Now instead of soft-touch plastic finish with a thick grooved strip going along the hinges, the interior adopts a single brushed aluminum plate. It definitely feels and looks nice but it’s also prone to fingerprints and smudges. We like how the keyboard is centered and well-positioned leaving enough room for the palm rest area and the upper part of the interior, which tends to get hot during load. It’s where both chips are. Anyway, speaking of the keyboard, we see the usual adaptation with slightly concaved keys with excellent clicky feel but somehow short key travel. The clicky feedback compensates for that making it excellent for typing but not exactly perfect for gaming. 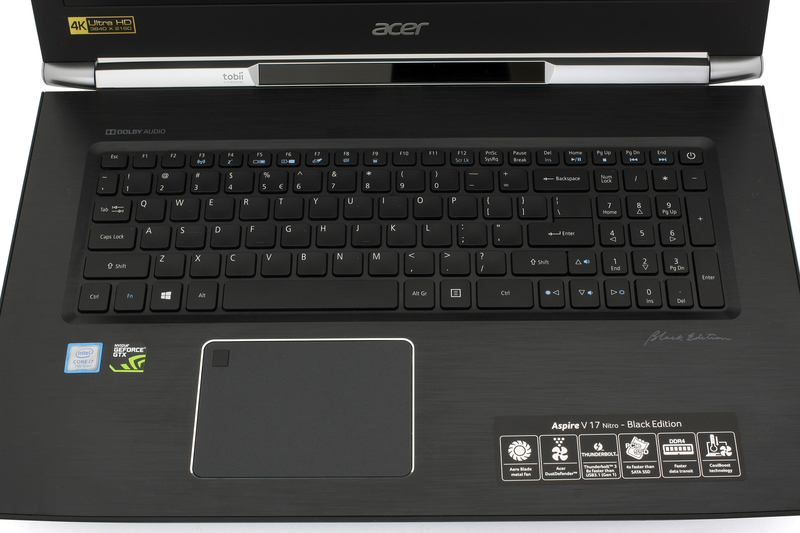 Acer doesn’t market this laptop for gaming anyway. Its purpose is to appeal to content creators and multimedia on the go without sacrificing portability and performance. And once again, the red LED backlight seems a bit dim but should be more than enough in a dark room. The touchpad, on the other hand, is light years away from what we’ve seen in the previous version. It’s big, it has a good gliding surface and slightly wobbly, but doesn’t really get in the way when swiping or using gestures. With the chamfered edges around the trackpad, it’s easy to spot the resemblance between the Aspire V 17 Nitro BE and some of the lower-end models from the OEM like the Aspire F 15 and Aspire E 15. We liked the touchpad experience on these two so there’s nothing wrong with using the same one in a higher-end model as long as it’s functional and comfortable. 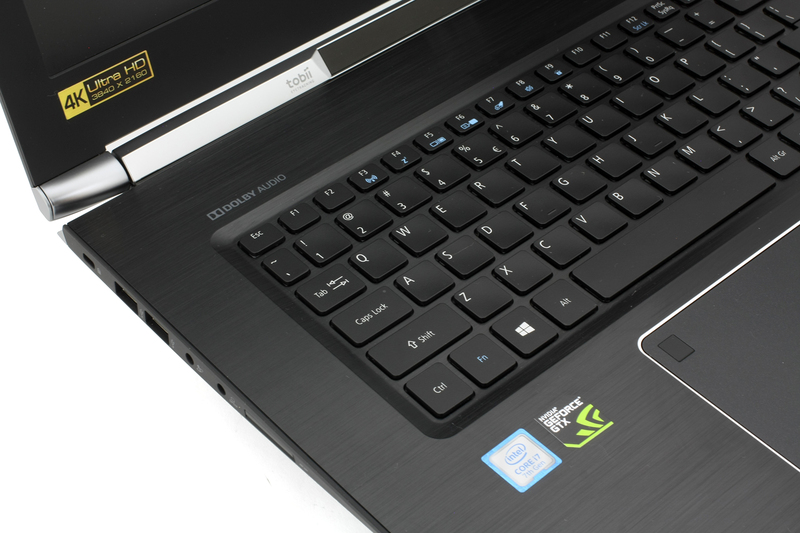 Along with the new touchpad design, the Aspire V 17 Nitro BE receives a brand new feature as well. We are referring to the fingerprint reader, which can be found in the upper right corner of the trackpad. We really liked the convenient and discreet location. To sum things up, the Acer Aspire V 17 Nitro Black Edition once again offers a sturdy, elegant and simplistic build with some extra attention to details. The weight hasn’t increased as much but the thickness remains the same while packing considerably more powerful hardware. Most of the changes, which are hard to spot anyway, are welcomed but some users might not like the fingerprint magnet surface used for the interior. We also hope that the aluminum plate won’t disperse heat so much when the laptop is under heavy load. You can find more information regarding this matter in the temperatures section below. 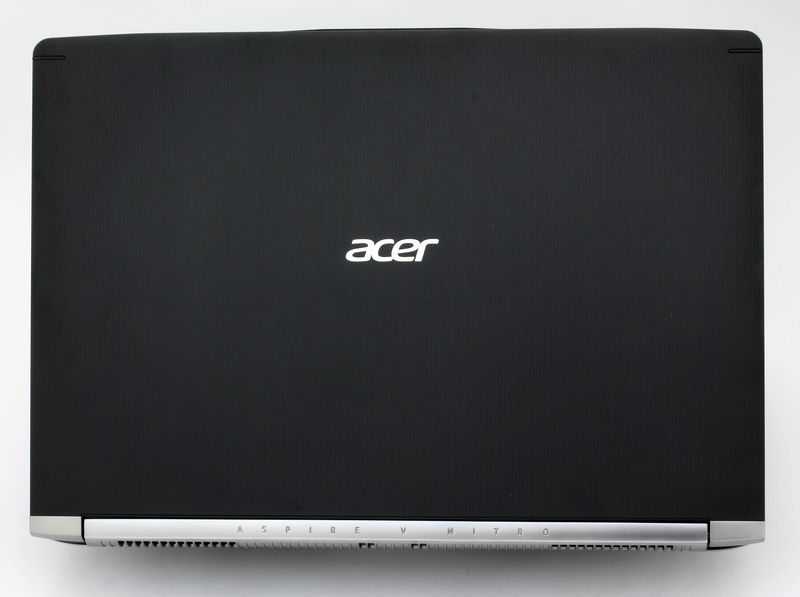 Thankfully, Acer’s redesigned Aspire V 17 Nitro BE allows for a much easier upgrade and maintenance, although maintenance lids are nowhere to be found. 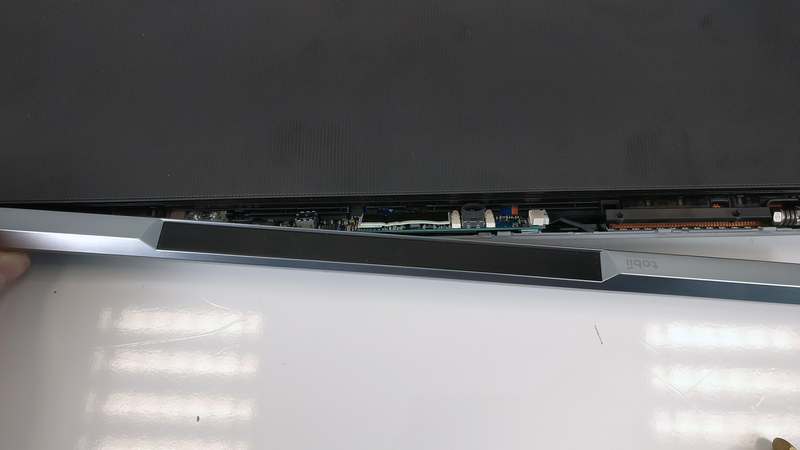 First, you need to unscrew all the bolts around the bottom of the chassis, then remove the plastic element covering Tobii’s eye tracking setup and remove the screw located beneath it. Then you can remove the bottom piece with ease. 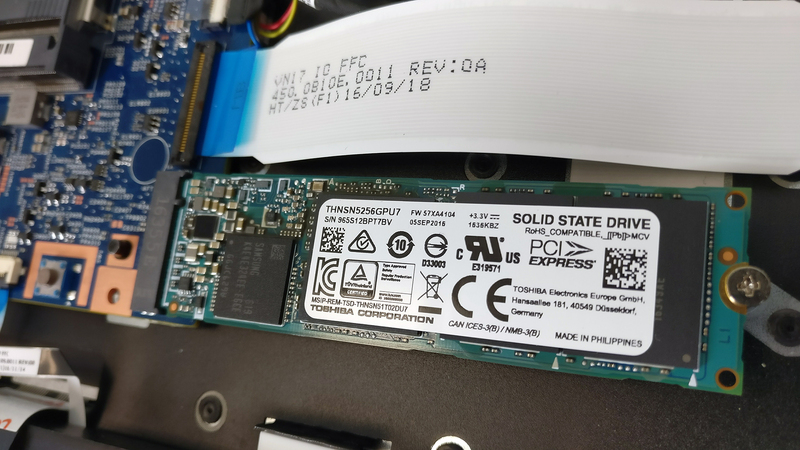 The 2.5-inch drive is easy to remove or swap and luckily, so is the M.2 SSD stick. 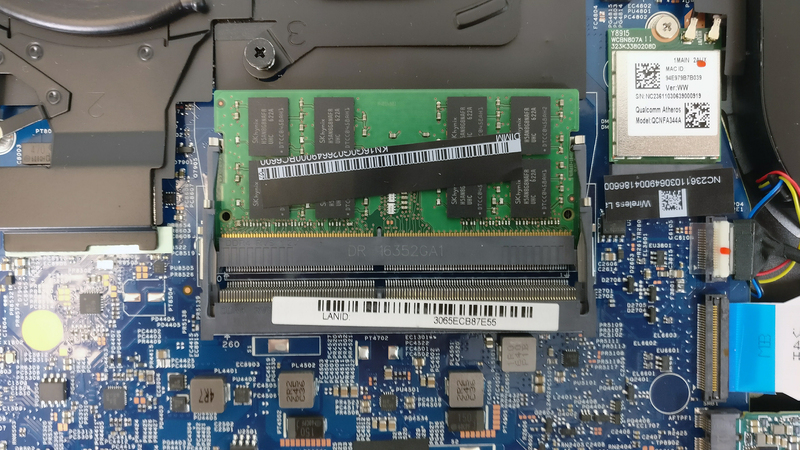 There’s no need to flip the motherboard around to access the M.2 SSD slot. It can be found under one of the cooling vents and our testing sample shipped with a Toshiba THNSN5256GPU7 2280 PCie NVMe SSD. with 256GB capacity. 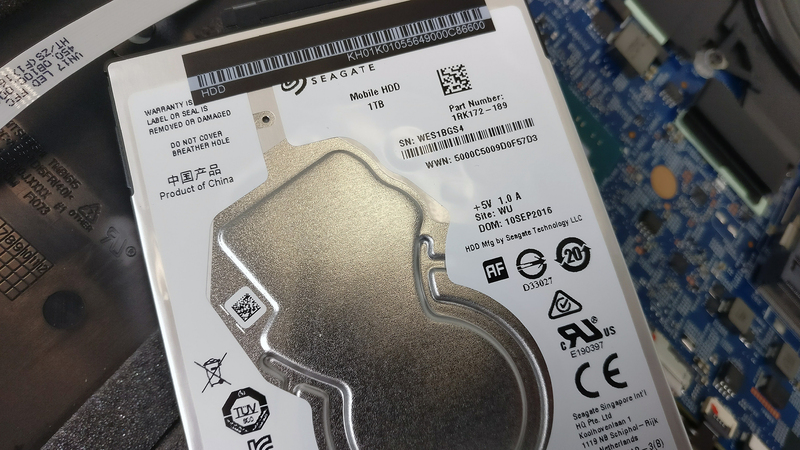 And as for the HDD, it’s Seagate 1TB. The RAM chip slots are also easily accessed and can be found righ under the heat sinks for the CPU and GPU. 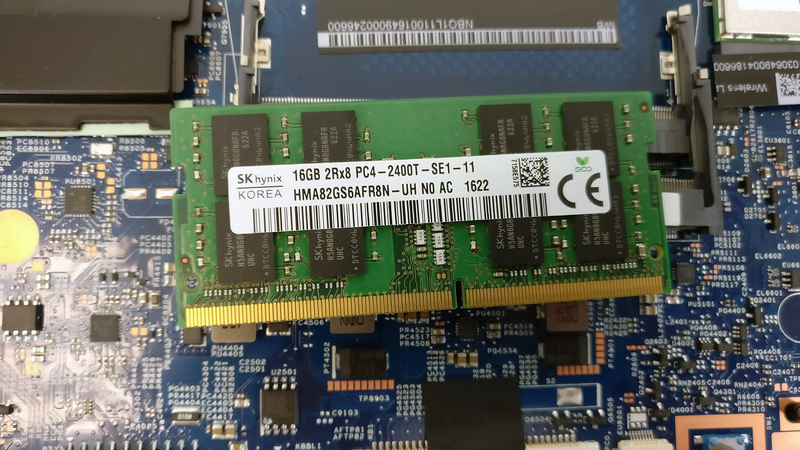 Each slot can hold up to 16GB DDR4-2400 RAM but our unit came with one SK Hynix 16GB DDR4-2400 stick. The Wi-Fi card is placed next to the right cooling fan with the bottom facing upwards. 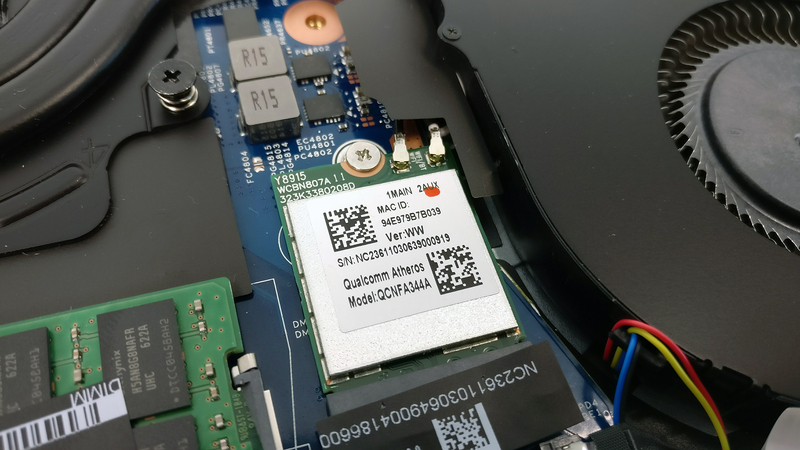 It’s manufactured by Qualcomm and the model is Atheros QCNFA344A. The battery unit is located under the palm rest area and it’s rated at 69Wh. There aren’t noticeable changes in the cooling design compared to last year’s model but the subtle ones make up for a relatively effective cooling system. 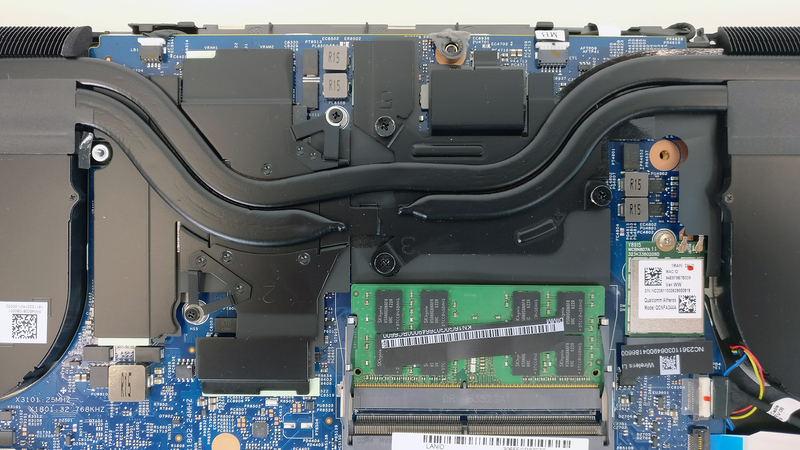 We’ve got one heat pipe going across both heat sinks and connecting the two cooling fans while the other two heat pipes are dedicated to each chip (CPU and GPU) individually. Probably Acer didn’t want both chips to share too much heat. Also, Acer used their well-known fans with thin metal blades, which also change their angle under heavy load for more effective airflow. This design was first implemented in their Predator series notebooks. A pleasant surprise here. 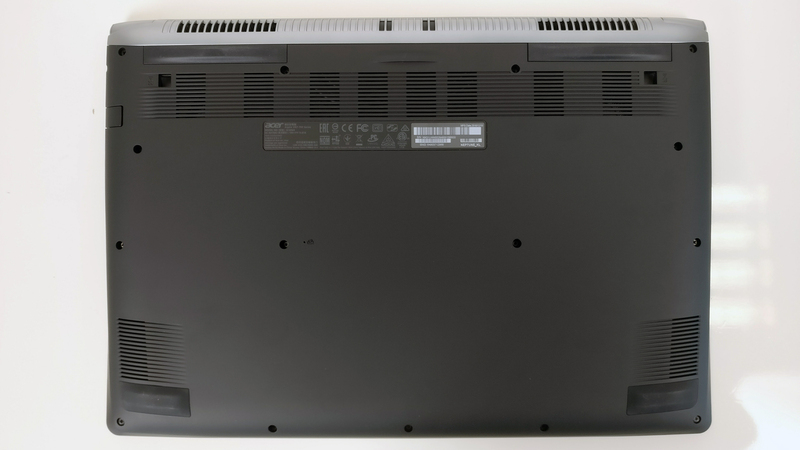 A quick check of the panel reveals that it’s the same one used in two other Predator laptos – the UHD version of the Predator 17 (G9-793) with GTX 1070 and the recently reviewed Predator 17 X (GX-792) with. This is great news because this is hands-down one of the best laptop IPS panels we’ve tested so far. So let’s get back to the panel itself. It’s manufactured by AUO with model number B173ZAN01.0 with 3840 x 2160 pixels resolution, 225 ppi and 0.1 x 0.1 mm pixel pitch. It can be considered as “Retina” when viewed from a distance equal or greater than 33 cm. Viewing angles are excellent with no noticeable color shift. The measured maximum brightness is 377 cd/m2 in the center of the screen and it’s 357 cd/m2 as average across the surface with 16% deviation. The color temperature is 6900K at maximum brightness so colors will appear slightly colder. But when the luminance is 140 cd/m2, the white point alings with the optimal 6500K. As we go along the grayscale under 100% RGB, the color temperature continues to drop, which means that color will be warmer than usual. The contrast ratio is 1020:1. We also measured the color deviation dE2000 compared to the center of the screen. The maximum value we got was 3.1, which is okay because values above 4.0 are unwanted. 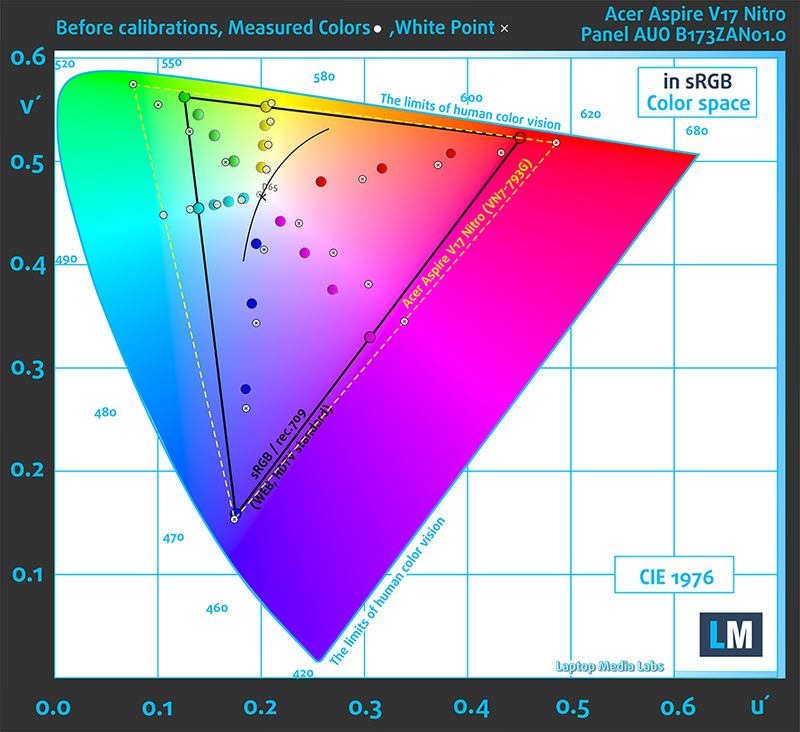 As we expected, the screen covers 100% of the sRGB and 100% of the Adobe RGB color spaces and almost covers the DCI-P3 in CIE 1976 gamut with 97%. And since this panel uses the Blue LED + Quantum Dots technology instead of the conventional WLED backlight, the spectral power distribution in the “Blue lights emission” section shows less blue light and longer wavelength of red. That’s because the blue light goes through the red and green quantum dots, which are practically microscopic crystals emitting light with certain wavelength depending on their size. 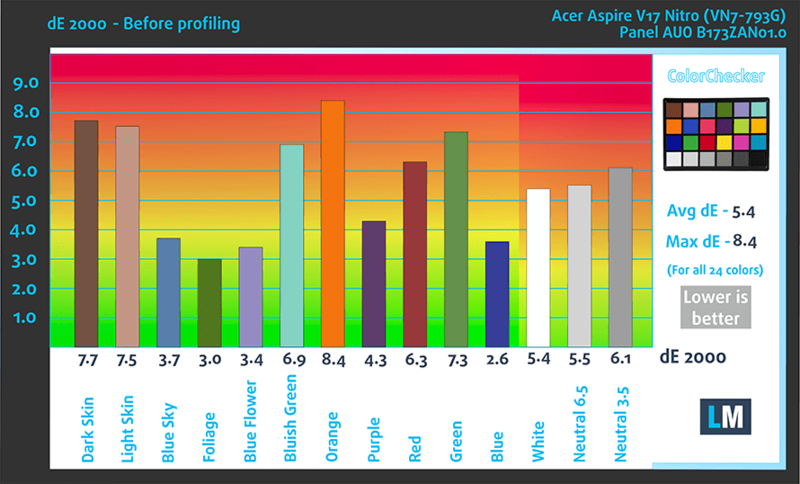 You can see how much of the colors the display can reproduce in the graph below. Look at the yellow dotted triangle. The stock gamma curve suggests of slightly darker image but our “Office and Design Work” profile fixes that. There’s also a slight adjustment in the color temperature. We tested the accuracy of the display with 24 commonly used colors like light and dark human skin, blue sky, green grass, orange etc. 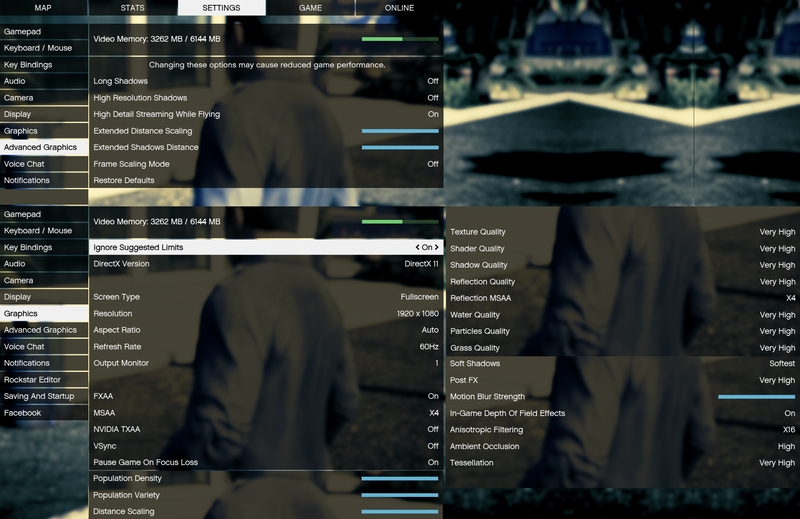 You can check out the results at factory condition and also, with the “Office and Design Work” profile. 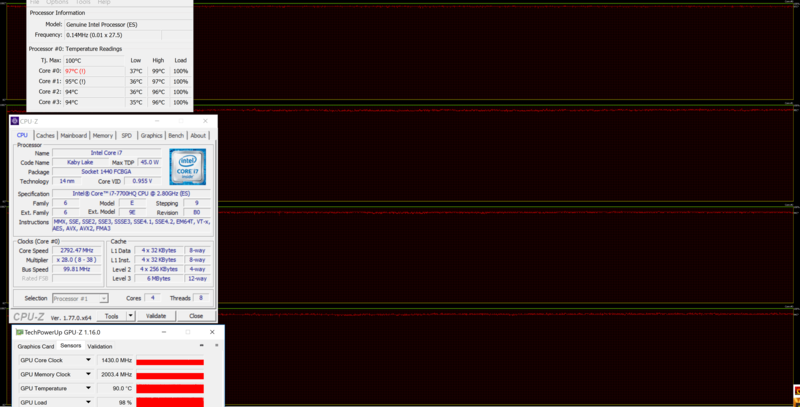 As expected, the notebook doesn’t use PWM for regulating screen brightness so it’s safe to use for long periods of time. 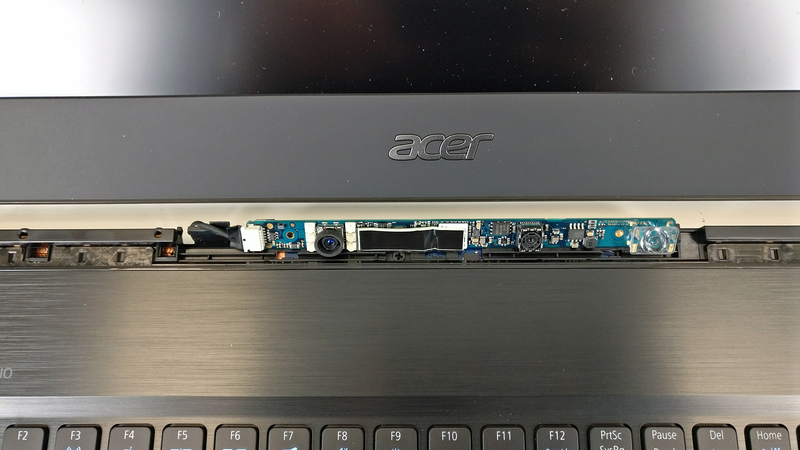 We were pleasantly surprised to find out that the high-end configuration of the Aspire V 17 Nitro BE uses the same UHD panel found in the Acer Predator 17 X and the regular Predator 17 with GTX 1070. The panel itself is one of the best we’ve tested so far with superb image quality and without PWM making it harmless to your eyes. It’s safe to say that the panel is ideal even for color sensitive work, especially if you use our Office and Design Work profile, which will further improve the color accuracy. The sound quality is fairly good in the medium and high frequencies but there’s not enough clarity in the low frequencies. 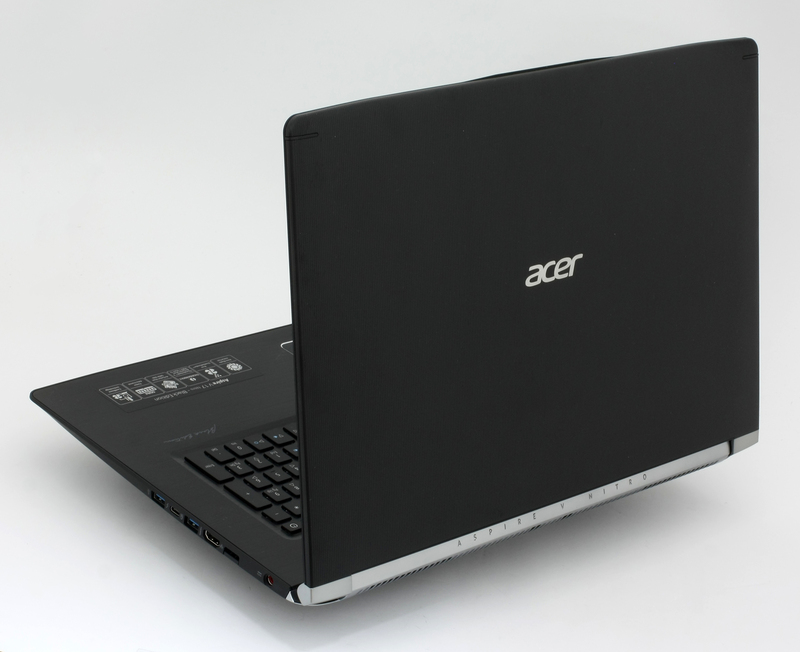 The notebook we’ve reviewed came with pre-installed Windows 10 (64-bit) but if you wish to perform a clean install of the OS without the bloatware, we suggest downloading all of the latest drivers from Acer’s official support page. We have a huge bump in the battery department compared to the previous model. The new one offers a 69Wh unit while the VN7-792G had a 52.5Wh battery. However, this increase hasn’t translated into better battery life on our unit because of the energy-zapping 17.3-inch UHD IPS display, but we believe that the Full HD model will offer significantly better endurance. So if battery endurance is of great importance to you, the Full HD model is the way to go. Quite expectedly, the notebook’s battery performance is subpar – 267 minutes (4 hours and 27 minutes). Even lower result on the video playback test – 191 minutes (3 hours and 11 minutes). It’s quite unlikely that you will start a gaming session without being close to a power source, but it’s good to know that you can play for more than an hour – 65 minutes (1 hour and 5 minutes). We perform this two-staged stress test to see how the cooling system handles heavy load for extended periods of time and also assess the overall stability of the machine. However, think these tests don’t represent real-life usage. We started with 100% CPU usage for an hour, as usual, and the CPU was ticking at 3.4 GHz for about a minute or so but then started going back and forth between 2.8 and 3.4 GHz. This was caused by the higher than usual temperature but fortunately, no thermal throttling occurred because 2.8 GHz is the base clock speed of this processor. After turning on the GPU stress test, things started to get really interesting. The CPU’s temperatures rose a little but in order to give enough headroom for the GPU to perform, the Core i7-7700HQ downclocked to 2.8 GHz and often dropping to 2.6 GHz, which can be considered as minor throttling. Still, it’s nothing that will actually effect you in real-life use. 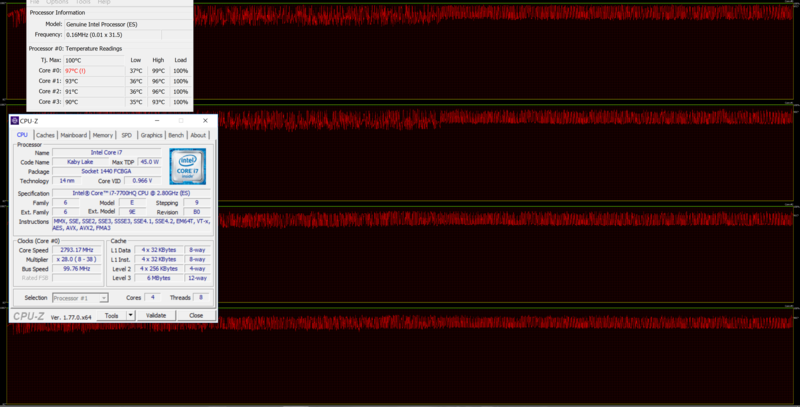 And as for the GPU, it was able to run at 1500 MHz for a while but slowly dropped to 1430 MHz while retaining extremely high temperature of 90 °C. 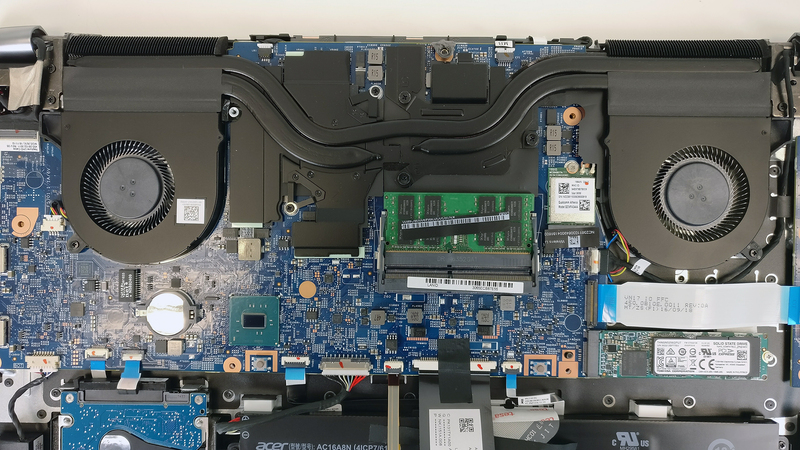 It’s really admirable that the cooling system is able to support the hardware during extremely heavy load for extended periods of time without thermal throttling in a thin chassis, but the high inner temperatures will – in future – cause some problems, especially when dust builds up and the thermal paste wears off. More frequent cleaning will be necessary. As expected, temperatures around the keyboard were pretty high. The area right in front of the Tobii eye tracker reached the whopping 53.4 °C while the center of the keyboard measured between 45 and 48 °C. The rest of the keyboard and the palm rest area remained cool, even though the interior is made of brushed aluminum, which disperses the heat easier than plastic. Under normal circumstances or gaming, temperatures will be much lower and we doubt you will feel any discomfort. In the end, we have some mixed feelings about the cooling system because it’s capable of supporting the powerful hardware without leading to thermal throttling but, on the other hand, the inner temperatures are extremely high. 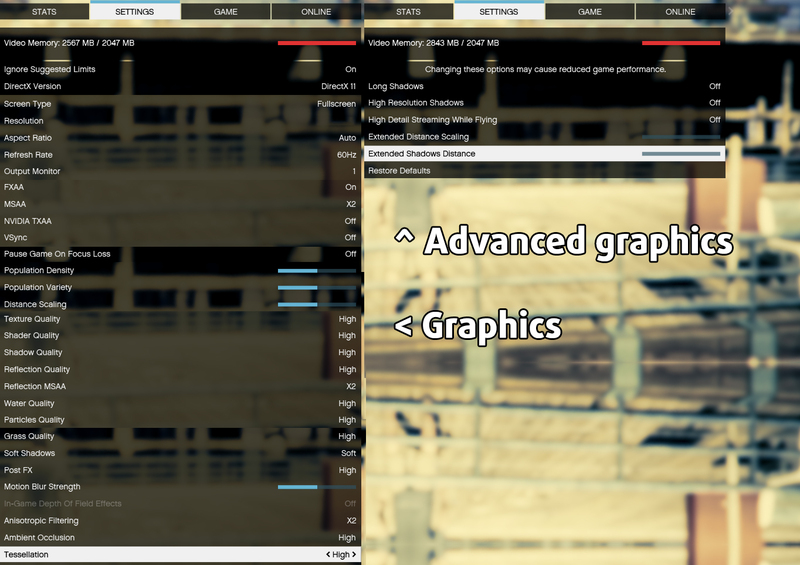 Even only with CPU load, the chip goes above 90 °C while the GPU runs at 90 °C under 100% load. The good news is that the cooling fans are able to push out the hot air fast leaving the interior relatively cool, especially considering the hot hardware inside. 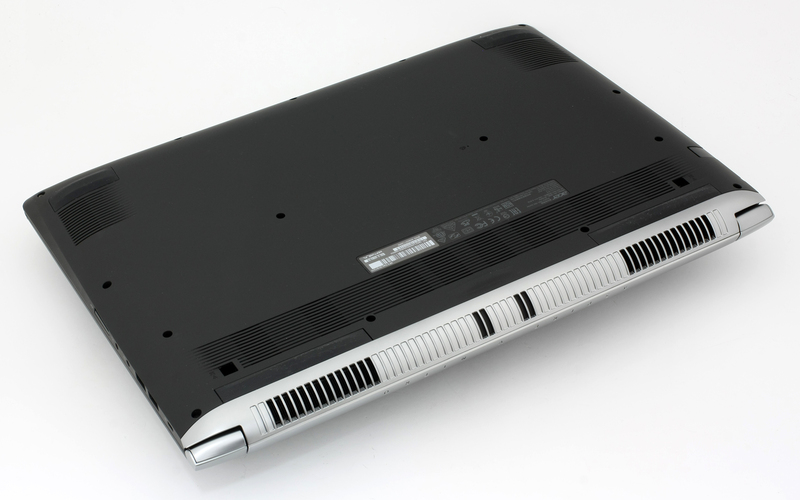 The Aspire V 17 Nitro BE lineup was associated and marketed as gaming-oriented but with the new VN7-793G version, the sub-brand makes an interesting turn. 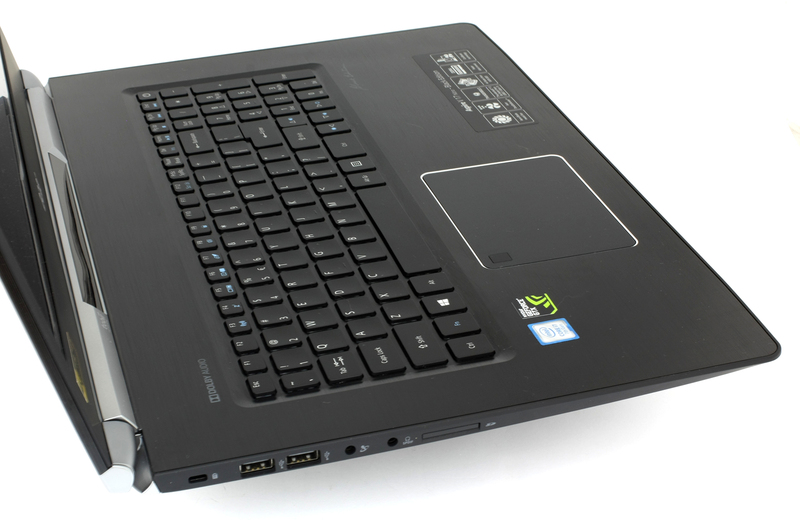 Yes, the hardware is typical for a gaming laptop and offers a lot of horsepower – enough to run AAA titles with medium to high settings with resolution cranked up to 1080p but the whole concept of the notebook makes it more suitable for content creation, multimedia purposes and some entertainment at the end of the day. Why? 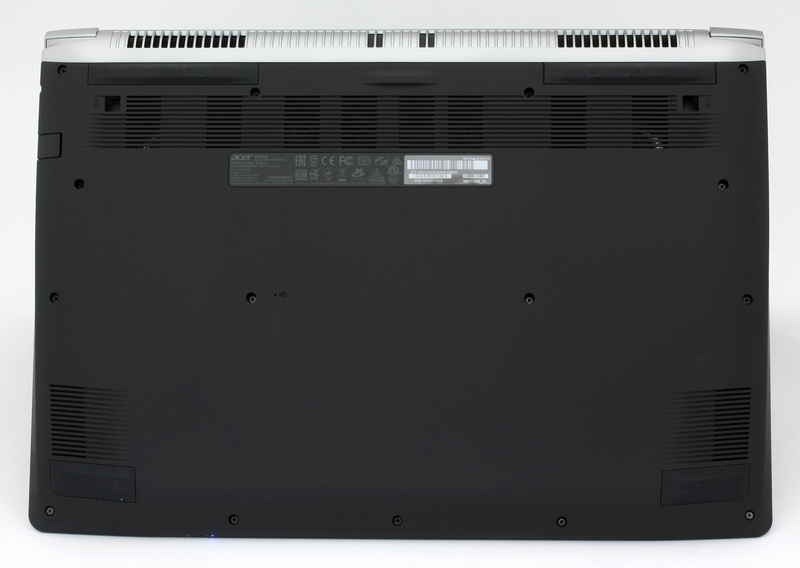 Because of the thin and relatively light chassis – for a powerful 17-inch laptop that is – kind of makes the cooling system sweat. Our tests, although extreme, show some signs of instability that should be conisdered in the long run. After all, the thin chassis before was able to handle the GTX 960M but the latter is nowhere near the GTX 1060’s thermals and performance. Just bear this in mind. Aside from the unconvincing cooling design, the laptop shines with good design and build quality, excellent keyboard and touchpad experience, fairly compact chassis for a 17-incher, neat features like Thunderbolt 3 support and Tobii Eye Tracking, and last, but not least, impeccable screen quality. The latter can be found in the UHD versions of the Predator 17 and Predator 17 X and makes it suitable for color-sensitive work as well as immersive gaming or multimedia experience. It’s probably the key selling point of the UHD version of this variant and we definitely recommend it if you are a content creator. We also recommend using our custom profiles because they let the screen stretch its legs and perform at its full potential in terms of color accuracy. Unfortunately, battery life suffers from those extra pixels. So is it worth spending a little extra cash for the UHD version of this laptop? It sure is, but only if you plan on using it for color-sensitive work, as a daily driver and a gaming/multimedia station sometimes in your spare time. But since the laptop isn’t gaming-oriented, it misses some essential gaming features like more gaming-centric keyboard, G-Sync for buttery-smooth gaming experience and a cooling system to support the demanding hardware for long periods of time. And if gaming is your top priority, we recommend the Acer Predator 17 (G5-793) with GTX 1060 – superior cooling system, better keyboard for gaming and 75Hz G-Sync-enabled IPS screen. In fact, if you are willing to spend so much money on the UHD version, consider the Full HD version of Predator 17 (G9-793) with GTX 1070 as well. Does the machine support Optimus, or is the GPU running all the time? Not sure whether it’s that easy. 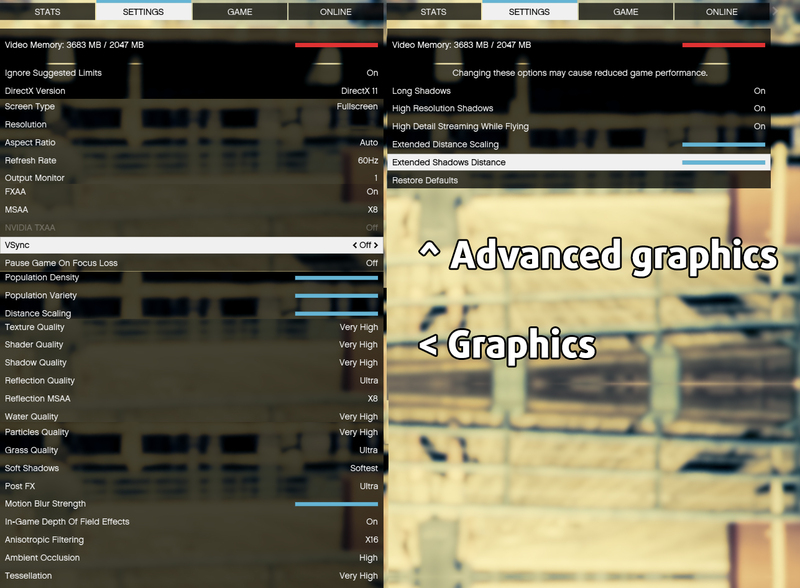 Sure enough, the absence of G-Sync makes Optimus possible, but did you try it? There is mixed information out, at the moment. When can we expect a test of the 15″ version? Does ALL new versions of this laptop come with Tobii Eye ??? Our best guess is that all models come with Tobii because last week we’ve ordered the Full HD version and it turned out with the tech as well. I really want to get my hands on one of these. Only available in Germany with a Qwertz layout it seems. Any idea when or where it will be available in the UK? Also avaliable in Finland and Estonia. 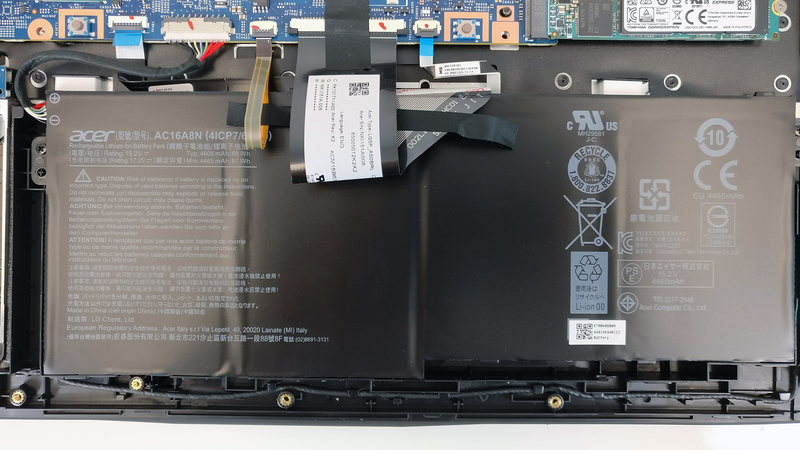 Hey folks, Does anybody know if it is possible to replace the 2015 v15 model’s battery with the one of 2017? It’s far bigger and mine else getting used.